Selling my Cactus Canyon Continued #811, date of manufacture Feb.16th 1999. It is running Eric's code on a new Azulle Quantum Byte computer controlled by Scott Danesi"s power up shut down controller. The game works 100%, is fully Led'd, with a beautiful original playfield and sound powered by pinball pro subwoofer and speakers. Has Color display. The cabinet is clean and solid and redecalled with a CC plaque. The trim and lock down bar are brass plated, no broken plastics, Tilt Graphics side blades installed, the train and canyon are custom painted and the apron decals light up. 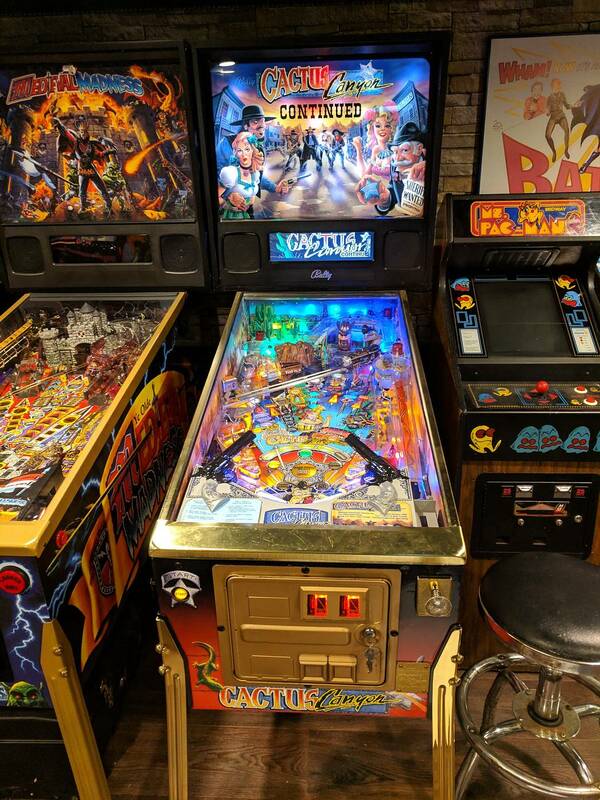 The playfield was treasure coved and the flippers rebuilt. New flipper bats, silicone rings, titan ring set, balls, and all the coil sleeves were replaced. The underside of the playfield is as clean as the top. The translite has the "CONTINUED" decal on the front and she has a CC lunchbox topper. The game is in great cosmetic condition. The only notable wear is a dime sized spot of playfield wear under the mine kickout which has been covered by a mylar disc and is very hard to find. The cabinet had wrinkles at the legs that were covered by the leg protectors. There is 1 chip that was bondo'd and 2 nicks on the right hand side head and an inch scrape on the right side of the body that has been covered up. I will ship at buyers arrangements and expense only if fully insured and paid with a bank wire or cashier's check. I will entertain all trades plus cash. I have a new set of cabinet decals if you need her to look perfect. I can provide more pics and answer any questions upon request. Games on my wish list are ST LE, IMDN, Aerosmith, Metallica, JJP Pirates, Dialed In. These are Gritty's all time market stats.